Thursday evening started five weeks ago, maybe two months ago. Thursday evening started when I sent a speculative message to our friend/collaborator Mr. Courage. It started when I first thought that publishing all Stan’s Cafe’s old scripts would be a fun thing to do, but only if they appeared in a set of 22 very slim volumes. 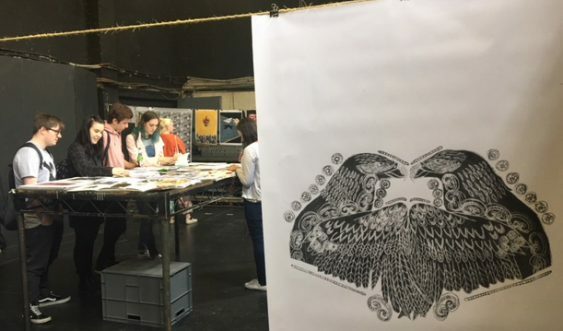 On Thursday evening @ A E Harris over forty first year illustration students from Birmingham City University exhibited their response to our front cover design challenge. Each book in the series was allocated to two students who were furnished with scripts, essays and notes on influences from music, film, the visual arts, history and science. They had five weeks to explore, experiment and deliver a cover inspired the something in that content. The results were spectacular. On show were prints, A0 photocopies of designs and, most compelling of all, sketch books in which it was possible to trace thinking and inspiration, experiments and blind alleys. To see so much enthusiasm and time and effort and imagination and passion invested in reinterpreting our back-catalogue was very touching. Some designs were very simple to link to shows: A portrait of Franz Ferdinand with an overlay of dominoe shards and blotch of blood. Paper airpalanes throwing fighter jet shadows on a children’s playground. A Who’s Who of rice grains dressed up for different jobs. A crown hovering above a crowd. A minuscule row of tulips set in a tiny bottle. Still others required deep investigation into the workbooks: a host of papier-mâché eyeballs (weirdly spot on for Simple Maths). a collage including a robin was hung for Twilightofthefreakingods where the workbook showed more apt images. I loved it, we loved it, it was loved. When the books are published we will try to remount the exhibition and share it more widely, then you can love it too.